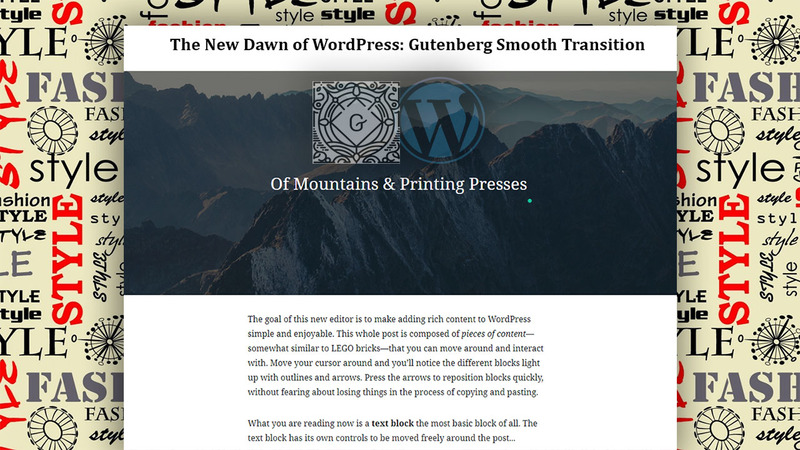 As per the official announcement, Gutenberg is all set to make its worldwide release in WordPress 5.0 with a Gutenberg smooth transition. WordPress-ers, it’s time for another quick round of news and stories for the most anticipated WordPress release of the year; and it is a big deal! In simple words, Gutenberg turns out to be an interesting way to edit content in WordPress. By replacing the conventional TinyMCE post content editor, this version offers endless possibilities in regards to shortcodes, widgets, menus, and even custom fields. The client-side interface is built with React that enables users to make the most of block-based system to come up with unique looking content. Unfortunately for many of you, this change might be scary as it has been a long time and all the workflow can be interrupted with the need to learn a new way of doing things. Fret not, Gutenberg aims to bring the best help possible concerning efficiency and flexibility especially when it comes to content. However, the main intention is that the editor will eventually replace the entire WordPress interface. This means each step of the website creation process will involve reliant on the drag-and-drop block-based system. Further below I would like to mention a few pointers to keep in mind when working with the editor. Initially released in 2003, WordPress was considered as another blogging platform where writing a post was pretty simple. All you require doing is add text with a few photos and hyperlinks for good measure. Being a simple box where you could do everything whenever needed, the previous WordPress editor was a perfect fit. And now, it’s time to give a warm hug to the new version. With the need of users creating more and more diverse types of content- custom mixes of text, multimedia, and more advanced design elements. And this is something that the classic version couldn’t handle very well. Basically, it becomes effortless to break surrounding content while trying to add something more complex to a page or post. It also requires us sometimes to edit code – which isn’t a comfortable experience for everyone. Gutenberg, on the other hand, enables, WordPress developers to separate different types of content into what they refer to as “blocks” where every block acts as a separate piece of content. Let’s take an example of the Image block located on the top of your page, with a text-even if you change the text, it won’t affect the image block. Other blocks include images, cover images, galleries, audio, lists, video, embedded media, lists, headings, paragraphs, tables, widgets and so more. Gutenberg will be considered compatible enough with a massive bunch of plugins available out there. Which means a majority of the edit screen to the content itself. With other settings, it will automatically get moved to a menu on the lower right. All you require doing is clicking on a title, and it will open the entire post up for tweaking. In addition to this, not every existing WordPress plugin is going to work with the new editor. So chances are there that you may find, numerous plugins being updated around the time Gutenberg is fully released with WordPress 5.0. Not everyone would like to upgrade. In the case of WordPress, if you don’t want to use WordPress yet can have it both ways. It may quiet interest you to know that the classic WordPress editor is available as a plugin so that you can both upgrade to WordPress 5.0 and keep on using the more familiar editor. Unfortunately, we do not have any idea how long the plugin version of the classic editor will be available. Depending on how many people use it. However, the alternative setup would be around for quite some time. So relax! #5 let’s give it a try! I am sure all the WordPress Developers out there must be interested in knowing what else the editor can do for you. Well, it’s available as a plugin. Unless and until it becomes fully integrated into WordPress 5.0, it’s recommended to use the plugin on your main website. The plugin version is updated once a week, with new features and bug fixes. Professionals who are curious enough will see things gradually improve as the editor evolves. But since it is not a fully-furnished product, you use it at your own risk. For those who have felt limited by the classic editor, WordPress Gutenberg offers a golden opportunity to do more with your website. Now with any change, there is a learning curve found. But I am pretty sure that the more you use Gutenberg, the more intuitive it becomes. and everything related to the web!